Show Class Magazine's Top 13 cont. I began this project with one main goal, to set some records out at Bonneville. 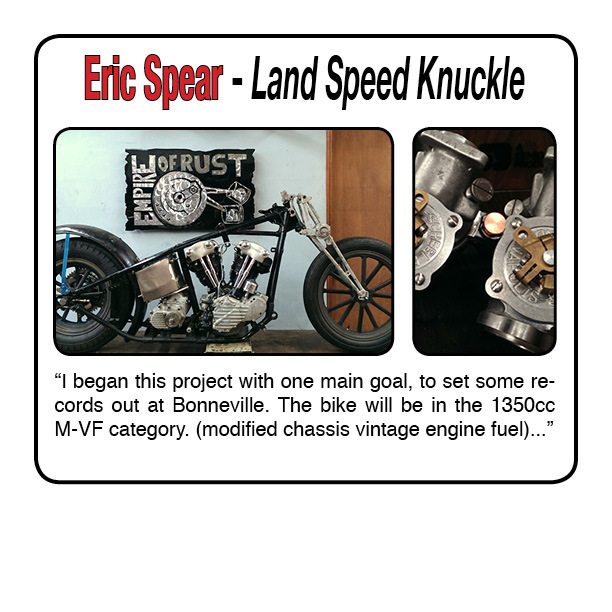 The bike will be in the 1350ccM-VF category, modified chassis vintage engine fuel. It will need to consist of all original engine castings. The frame will be original, slightly modified. The bike is in a million pieces at the moment. The heads are in the process of being modified for dual carburetors, ported and finished off with some oversize valves. 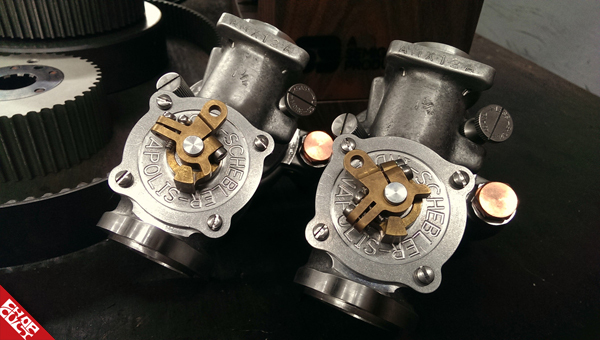 I just picked up a set of schebler barel carbs set up for alcohol. I will be running a mag in the generator position and Magnesium American racing wheels. I was originally going to run a British girder but have since switched over to a Indian Jr Scout Girder. I am also in the process of building an aluminum oil tank similar to the original horseshoe. The fuel tank will also be a aluminum tube type tank. I will be running a TORO or B&Hshifter so I have the sprocket clearance of a hand shift lid. The Mor X pense bike has been my inspiration. I want to keep the bike somewhat period. No Red and Blue AN fittings all over as I have seen on other vintage category LSR bikes. Ok so here it is. My '74 Denvers Ironhead. The frame and front end were a barn find and given to me from a older man with vertigo. 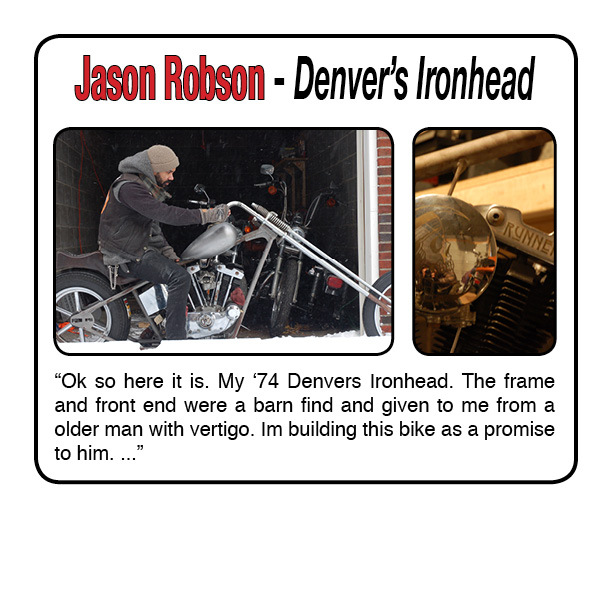 I’m building this bike as a promise to him. Attached are the best pics I have of the bike assembled. 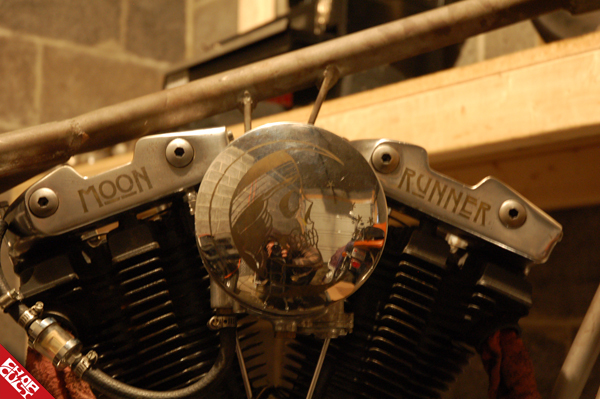 At the moment it’s torn down to add tabs and bungs for things like the fender, sissy bar, pegs. So on and so forth. A couple other things that are happening or have happened since I broke the bike down are a new top tree, water jetted, since the front end didn’t have one and I couldn’t find one narrow enough. I inset a compass in the narrow alien gas tank so that id always is able to find true north and I have a thing for brass. Along with the compass I put in a flush mounted gas cap. Attached is also a photo (apologies for lighting) of something special I did on the rockers and air filter. Using a method I generally use for making knives, I chemically etched "moon runner" into the rockers and a crest I use a lot on the air cleaner of a Indian skull in a moon looking towards the constellation where the 'North Star' can be found. I did this by making a sort of silk screen of the image and font, coating the metal in electrolyte and burned the words and image into the metal with a DC current. As you can see, being from my area in the country is important to me since the weather always comes into play weather building or riding. I sent a photo of the seat I am going to use but before I do I’m cutting the pan down and flatten it out a bit. As you can see in the full bike photo, it sits a little too high in the back. As much as I like the stitching and the leather color, I’m shooting for a lower profile on this bike overall. As for the rest of this build, I’m running round spoke invaders that i found instead of the square spoke (spool in the front, drum in the back). 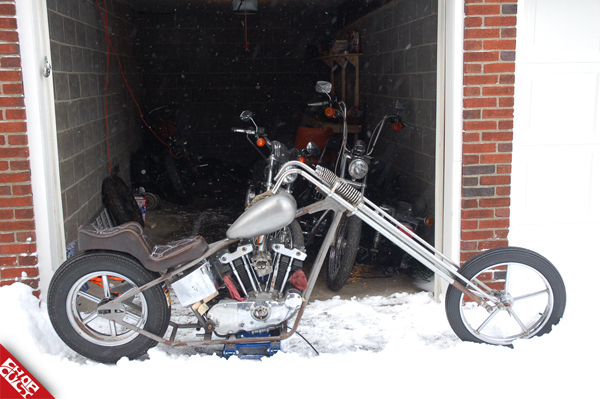 I cut some Flanders pull backs to go with the springer and keep the front end real narrow. The Carb is an S&S Super E but im not running the standard tear drop cleaner. After I get the top tree back and get the bike standing up proper, ill build a medium height sissy bar and some custom exhaust pipes to upsweep a bit. I wanted to wait to set those up so the angles are all correct and the bike flows together. When all of this is sorted in the next few weeks, the bike will go to paint. For paint, im on the fence between a mellow cream white with hand painted flourish all over in a darker shade or a midnight blue/black color all over with the same flourish in a lighter color. I hope this is enough information for you guys to make an educated decision. I have a couple other tricks up my sleeve but I want to leave something to surprise everyone with. I’d also rather not claim those things in case I can’t get them to work the way I want. Let me know if you need anything else from me. Happy judging! 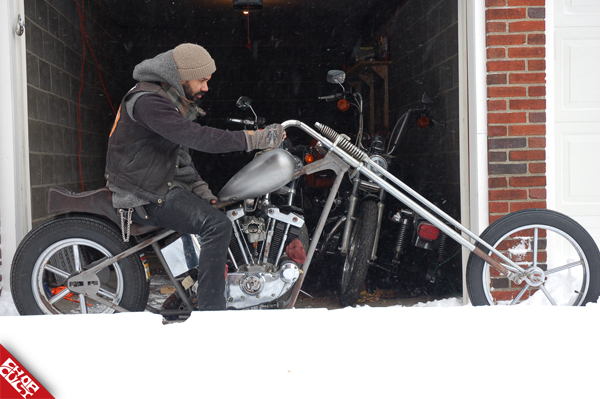 My name is Kyle Edgar, owner of Leadfist Cycles, upstate NY. 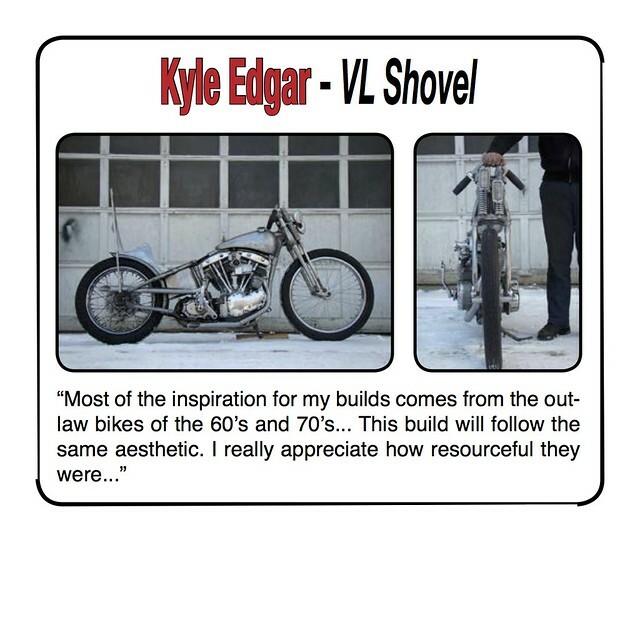 I am currently building a '68 shovel in a '34 VL frame.Most of the inspiration for my builds comes from the outlaw bikes of the 60's and 70's... This build will follow the same aesthetic. I really appreciate how resourceful they were with what they had, making something radical out of it. I usually find myself working the same way, which actually forces me to be more creative... often seeing better results. I want to keep this bike super narrow...lanesplitter... clean lines, with some height in the back. 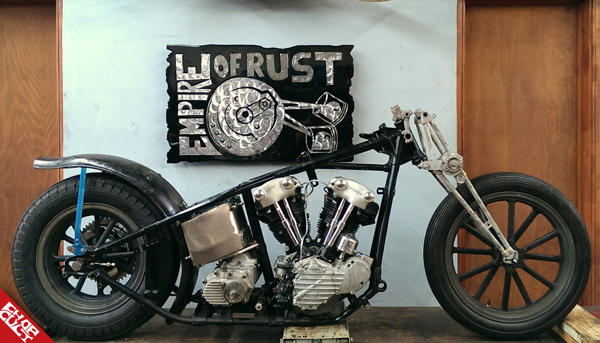 This whole project began with two wrecked VL frames that I got from a buddy of mine. I pulled out all the good castings and tubes to put together one good frame. I've been collecting the parts for this build for quite some time.... I thought this competition would be the perfect opportunity to get this thing done, and stop procrastinating. It took longer than I wanted to accumulate everything and it all needed quite a bit of work... but my funds were limited. With many of my customers I do a lot of bartering, which is how I've obtained a good amount of components on the bike, including the motor and transmission. I started with just the cases for the motor and had to search for the rest of the parts. All the internals are brand new, with some performance upgrades. Both the motor and transmission were built in house. The most difficult part of this build was trying to find the 'right' gas tank for this bike. I could have thrown anything on it, but I wanted it to fit the lines of the frame a certain way.... So, I took two aftermarket split tanks and combined them into one narrow tank. 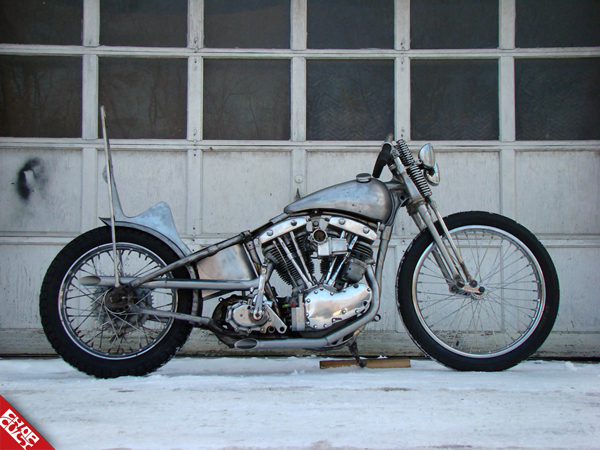 I used the old-style shut off valve from my panhead to keep it traditional. I threw together some bungs for the shutoff valve and also recessed the tank mounts under the tank to follow the frame lines and keep it clean. I fabricated the oil tank to make it fit better than a standard horseshoe. Haven't gotten around to making the fittings yet. I'm making custom oil lines as well, and both the lines and tank will get chromed. I narrowed the off-set springer, which I picked up for a hundred bucks because it was totally butchered. Added some extra details. The headlights are VW fog lights.... the kinda grew on me, and thought I'd repurpose them. The rear wheel is an 18" rear-drum, built in '62 for the drag strips. The fender is an old english ribbed.... swapmeet special. I'm not sure I'm really feeling the sissybar just yet... might have to change it up. Working on a king-queen seat for me and my old lady, to be upholstered in-house as well. I just got the exhaust tacked up... trying to keep it tight to the frame. Still need to do the finish work, and fab the mounting brackets. One of the last things I need to focus on is my foot controls. It's going to be a hand clutch, one up - all down. Just finishing up all the little details. 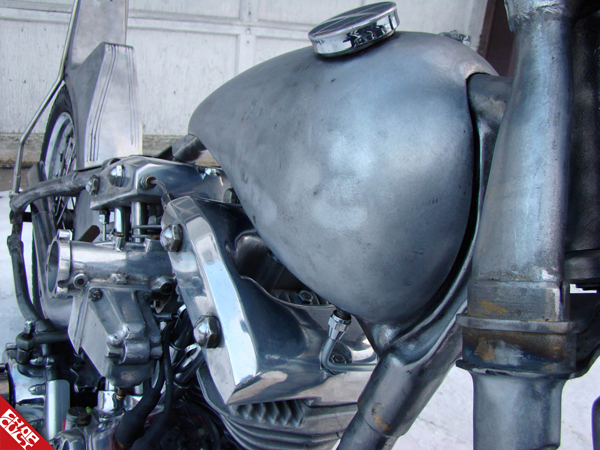 In addition to the oil tank, I'm getting the front end, the exhaust, the sissybar, and other doodads chromed. Not settled on the paint just yet.... not too over the top... but classy. I'd like to thank Show Class and everyone involved for taking the time to check out my work and allowing me this opportunity. I hermit. I stay in cave.